Dragon Mountain Treasures | Geology gifts and fun for your kids! We have a lovely assortment of kits and supplies just for kids! Help your rock hound kids enjoy geology! You can shop at our Etsy shop for beautiful, one of a kind rock, mineral and fossil specimens. 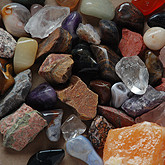 We have a lovely assortment of tumbled and rock bulk material as well as individual specimens, rock hound supplies and more! Some of our favorite places to visit, all about geology and the earth sciences! Geology is one of those fun things that all kids love! You can't go wrong with some of our best deals... from the Rock Hound Deal to our Birthday Party Supply Kits, we've got you covered! 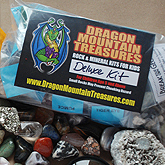 From Home Study Kits, Deluxe Kits, Crystal and Fossil, Dragon Mountain Treasures is a one stop shop for all things geology! 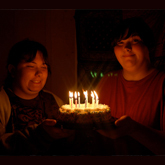 We love geology birthday parties and they are so much fun for your Rock Hound Kid! Check out our info page! Our geology birthday party was such a hit! Everyone loves the geodes and the rock goody bags! Thanks! - Kathleen D.
I love that everything is so reasonable and available for my rock hound kids! - Jill S.
Don\\'t Forget to Visit Our Blog!